子猫のニコの成長日記 - 6日目 お兄ちゃん猫の尻尾で遊ぶ子猫 Kitten Playing With Big Brother's Tail! 子猫のニコの成長日記 – 6日目 お兄ちゃん猫の尻尾で遊ぶ子猫 Kitten Playing With Big Brother’s Tail! 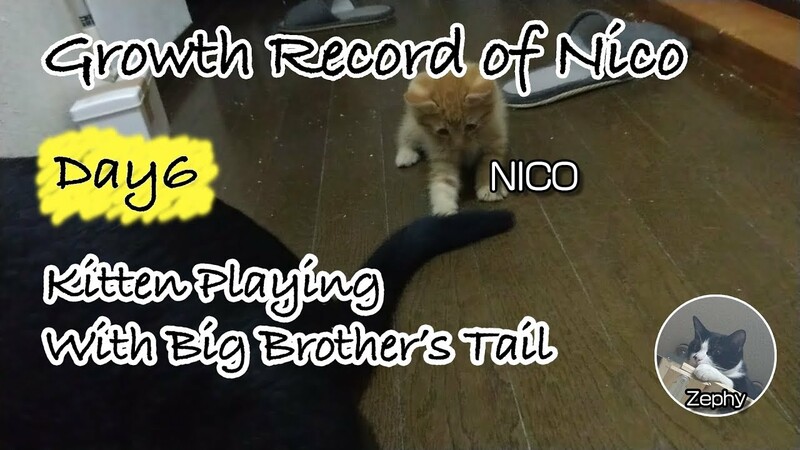 Nico is playing with big brother’s tail. Nico: a rescued kitten. Male. About one month old. He was at animal shelter my brother works for. Nico loves to dig in litter box. He stays at my parents’ house before we move! Pepe: an orange cat. Male. 8 years old. He is calm and caring. He shows maternal instincts when he sees kittens… even though he is male. Kuro: a black cat. Male. 8 years old. After parasites in his body got exterminated, he started to gain weight. Now he is such a fat cat. He is also very territorial and loves to patrol around the house. Zephy: a black and white cat. Male. He is about 1 year old. He is very active and loves heights. Cinnamon: a white cat. Female. She is only female and the oldest cat in the house. 17 or 18 years old. She sleeps most of the day, but sometimes she gets rejuvenated and plays with young cats. Please leave a comment and subscribe!